Here are the various jerky drying methods used when preparing venison jerky. Although some recipes may call for a specific jerky drying method, you can experiment with other drying methods. In general, the oven works fairly well for drying all types of jerky. However, it is important that the heat setting be as low as you can make it. Do not use the broiling element. The lowest bake setting should do the trick with most ovens. If your broiler element comes on even at the lowest bake setting, you can place a cookie sheet or heavy-duty foil on the top shelf to help deflect the heat. If your oven is not vented, leave the oven door ajar by placing a wooden spoon in the opening to hold it open. You may find it necessary to have a fan blowing toward the open door to encourage air circulation. Do not overload the oven. In general, optimum drying temperature is 140 degrees F.
These machines usually have multiple layers of stacking trays. In general, they operate at 140 degrees F., but keep in mind that the lower trays will get more heat than the top trays. As such, you'll need to keep an eye on your jerky and rotate the trays from top to bottom regularly, at least at one-hour intervals and perhaps even every half hour, depending on the food. As it approaches the final stage, you may need to reduce the heat by ten degrees to avoid scorching. Meat should be arranged a single layer deep per each tray with no edges overlapping. Although you will find some recipes for jerky made in the microwave, it is generally not recommended due to uneven heating. It may be difficult and painstaking to keep a smoker at the constant temperature of 140 degrees F. necessary to make jerky, but many love the flavor. Do not use any soft woods such as pine, fir or conifer. Proper jerky drying should take between 10 to 24 hours, don't be in a hurry. 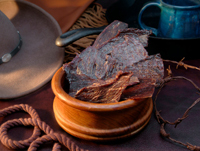 Properly dried jerky will keep at room temperature 1 to 2 months in a sealed container. However, to increase the shelf life and maintain the flavor, refrigerate or freeze the jerky.